Here's what to expect on a Sunday morning. If you have experience in a Catholic or "Mainline" church, you will experience something a bit less formal here. 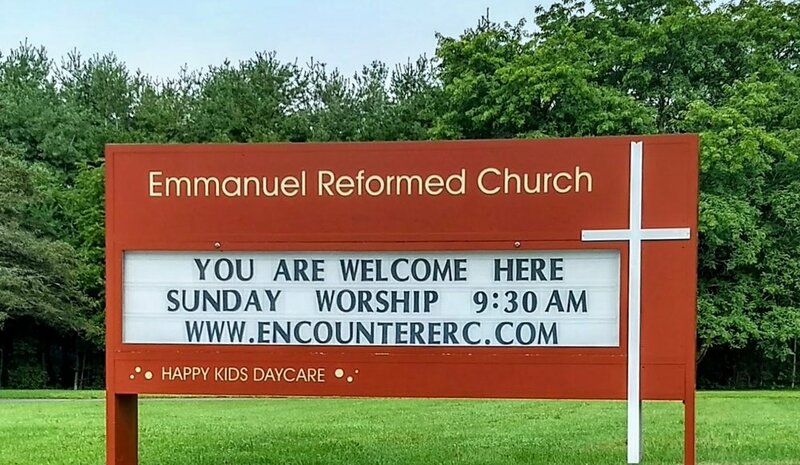 If you have visited a newer church, you will probably find ERC a bit more structured. If you don't have any church experience to speak of, you will find a welcoming and friendly place which blends the old and the new as we grow spiritually and help others. The worship service starts at 9:30 am, and most people start arriving about 15 minutes beforehand. The main parking lot is around back, and there will be greeters just inside the doors to say hello and point you in the right direction. If you are bringing young kids, ask for the nursery if you want them cared for by a professional during the service. Many places will tell you to wear what is comfortable, but really what you want to know is what other people are wearing so you can fit in (who wants to stand out when they first visit?). The spectrum is pretty wide from more formal to very informal. While there are a few suits, and a few t-shirts, most guys are somewhere in between. Women always seem to look nicer than the men, casual dresses and skirts are not uncommon, but really - wear what you want - you will be welcome here. You will be given a bulletin to guide you in the overall flow of the service, but everything you need will be projected so you can simply follow along as you feel comfortable. After everyone is welcomed, there are a few songs, mixed with prayer to help direct our attention away from our worries, schedules, and distractions, and onto God. It is a helpful reset in your week. The teaching is based on the Bible, and pastor Dirk strives to make the messages clear, helpful and decidedly un-boring. On the first Sunday of the month we share in the ancient tradition started by Jesus of eating bread and drinking a small amount of juice remembering Him (called Communion or The Lord's Supper). We do collect donations each week, but no one, especially visitors, is pressured to give. The music throughout the service ranges from songs that have been sung by Christians for hundreds of years, and others which were written last year - but all of it is for the purpose of focusing our attention on God. Come experience our open and welcoming "semi-traditional" feel. We love kids at ERC! As a smaller family church, you decide what is best for your kids. There is a staffed nursery for infants and toddlers - but feel free to keep them with you during the service if that is better for you and for them. During worship we have a special time where the kids get to come up to spend a few minutes during the service with the pastor. After this "Kids' Time" those who are third grade and younger can go out with volunteers for a fun time until Sunday School classes start after worship. Kids of all ages have the great opportunity of an age appropriate Sunday School Class from 10:30 to 11:15 am. They go with their teacher after worship, and parents (after a time of refreshments) can pick them up at the end of class. Sunday School runs from September to mid-June.